"We are going to have to address the situation of security," Keen said. "We've had incidents of violence that impede our ability to support the government of Haiti and answer the challenges that this country faces." Fear of looters and robbers has been one of the factors slowing the delivery of aid. After Tuesday's earthquake, maintaining law and order fell to the 9,000 U.N. peacekeepers and international police already in Haiti even though those forces also sustained heavy losses in the disaster. Rescue efforts and getting food, water and medical supplies to earthquake victims were the focus of efforts Sunday, U.S. officials said. An estimated 100,000 or more people may have died in the magnitude-7.0 quake. As of Sunday, the State Department said the total number of confirmed U.S. death was 16, including one embassy worker. There have been 62 live rescues, Tim Callaghan of the U.S. Agency for International Development's foreign disaster assistance office said Sunday. American search and rescue teams had performed 29 of those rescues. "We are still in rescue mode," Callaghan said in a conference call with reporters. 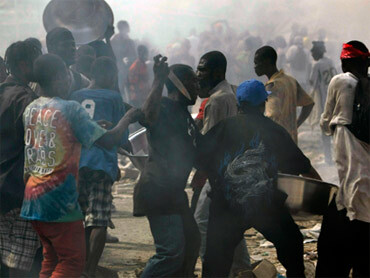 He said the decision to move to recovery will be made by the Haitian government. "Obviously we're getting closer to that painful decision of moving from searching for people to recovery," Callaghan said. Air Force Col. Buck Elton, commander of the U.S. forces directing flights at Haiti's airport, told reporters that 24 patients have been brought to the airfield for treatment. Of those, 16 were Americans with what Elton described as "crush injuries." Elton said the ability to get flights in and out was improving steadily. He said the rush of supplies and aid from other countries initially overwhelmed the airport's limited capacity. Decisions also have to be made on which cargo is the highest priority and needs to come in right away. Elton said about 60 percent of the flights coming in are civilian and 40 percent are military. National Security Council aide Dennis McDonough said the U.S. Coast Guard cutter Oak arrived Sunday with heavy cranes and other machinery to get Haiti's main shipping port up and running. The port was heavily damaged by the earthquake and is central flow point for fuel. Keen and Shah spoke on ABC's "This Week," NBC's "Meet the Press" and "Fox News Sunday  three of five Sunday shows on which they were appearing.